Many choreographers from different theaters created ballets “Pulcinella” and “The Rite of Spring” as two different productions that could exist separately. 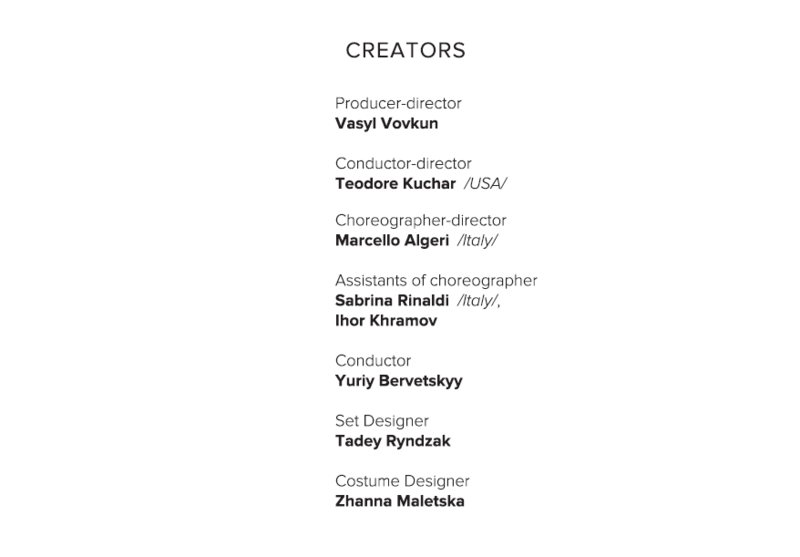 However we decided to create a single integral production in which these two ballets with such a different music style are the parts of a single action. It interprets two basic aspects of life. “Pulcinella” – is a symbol of reality (comedy, joke, and virtual game), symbol of everything that is hidden beneath the mask and is ready to change with ruse, according to circumstances; symbol of pretended truth that diverts our attention from minor events. However “The Rite of Spring” is a true reality that lives inwardly, in the deep subconscious dimensions, and affects all our decisions, that is, Eros e Thanatos (stress and fear of death – according to Freud). So, on the one hand there is the mask, beneath which we hide our “ego”, on the other hand – “ego” appears as the truth. The main idea of ​​this ballet is to search for the effective pure power that sleeps for a long time under the mantle of winter, war, terrorism, and which suddenly explodes, embraces the world, rejecting the false tragicomedies which we experience in order to fill a sense of true reality, reconstructed, reorganized, and full of power of Genesis. This power is human love in its most significant and true aspect, which symbolizes the action of creation of space and joy by God. In act one, the mask represents lie, despite the fact that Pulcinella is a character full of love and generosity; in act two the sacrifice is emphasized, which, although meaning the violence, hides the power of a person who strives for Spring. In the context of world culture the concept of the performance “Truth beneath the Mask” expresses the rejection of any idea that is not universal, but rather – on the contrary: it is the same everywhere and at whatever time. This ballet is the anthem for the harmony of relationship between a man and a woman, the union of peoples and nations, not theoretically, but “in the depths of the flesh”; union of heaven and earth. It is a dance of life and death, eternal universal freedom and love. “Pulcinella” in its grotesque and allegorical manner tells the original story about the life of the famous Italian character of the theater del arte; about a mask and a false self-esteem based on a metaphorical vision and an ironic reality with an appeal to literature (from Pirandello’s book “One, No One, One Thousand”); with the apprehension of light and shadow (Caravaggio) and metaphorical interpretation of the philosophy of a mirror: an inability of a modern person to imagine him/herself in the contemporary world really and the need to invent a character which is able to communicate in the world of lie and illusion, that is in the virtual world. Dance, in this case, has modern and neoclassical code, expresses an ironic and infamous smile, and at the same time represents artificial reality and artefacts – through the vision of a comedy, which, unfortunately, never ceases to be created and re-created. It is unbalanced, uneven in the virtual world, and opens the way to the act two, where the dance returns to two primary feelings which, according to Freud, determine the world (Eros e Thanatos). What others see in us is an image, often a reflection (2 / Mirror), in which we pretend to be someone else. It resembles the mirror space, where one surface resembles water and human soul, and this is achieved by a play of reflections, the rules of which are ambiguous. Thus, the mirror becomes the instrument of knowledge, the object-bridge between reality and fantasy, the metaphor of our life. What is truth? When does right become left in the mirror…? Maybe we are someone else or not? (3 / Inverse symmetry). An interesting thing in the modern world is that when you want to establish contact with someone, you need to find a character for communication, but he/she is not what we are… And slowly we start to trust in this character. (“You forget about the “person” and trust in the “character”) (4 / Real person or character)”. This character distorts reality and allows you to hide (5 / To hide where there is more light). To hide is the initial reaction of a person, which arises from the fear of being oneself, of being condemned by oneself, and the way to close (hide) ones personality, and to show another identity, that differs from the real one. But the mask reveals the face of truth more than what lies beneath it, because as a result the existence turns into what it pretended to be, since each mask has a “hole” from which the truth flows (6 / Light and shadow). Sometimes we do not understand what is better: to be oneself and try to improve, or to be “beneath the mask”? The masking mechanism creates an environment built on illusions (7 / Joke, loneliness of Pulcinella), which contains many “friends”, which disguises great loneliness. Finally, the true character of Pulcinella is born: intelligent, capricious, cunning, with many faces and facets, but with a big heart full of “lonely love”. Full merger of dance and music, projection and absolute coordination between the scores – choreographic and musical, shows this reality. The modern dance is used to present inevitability of adopting the code of reading, because only in the dance and through the dance the hidden truth is interpreted. The interpretation of the “The Rite of Spring” is devoid of any folklore figurative style, it remains natural successor of the original, but is deprived (released) of any historical reference (communication). Facing the horror of the future sacrifice, the main heroine nervously dances a violent solo before panic and confusion, in a true fever of sensual tension that radiates the desire to escape from its own destiny, but realizes that purification will come only through sacrifice; brings the idea of rebirth of the New World. In the “mythical arena”, where the fiery violent struggle takes place between opposite genders, between different peoples (2 / War) (“men on one side, women on the other; always against and always together), there is the disappointment and awkwardness of the choreographic lines regarding monumental music of Stravinsky (3 / Life). The giant choreographic fresco embodies vain struggle against death, the struggle that is ineffective, but with feelings of joy and self-sacrifice (4 / Shadow and Light), which concentrates on the image of one heroine (here is the reference to the image of loneliness from the act one). This image becomes a symbol of individual freedom (the end of the act two “Spring”). (6 / Sacrifice). At the end of the production there is the final musical reprise, when the Equilibrium (Balance) is sought between Shadow and Light through Intelligence and Love, in order to restore balance and give a hope to humanity. (1 / Equilibrium between Good and Evil). Note: part № 7 (the introduction to the second part of the “Sacrifice”) from the original score is not performed. Within the “Ukrainian breakthrough” project the repertoire of Lviv National Opera has been extended with “Pulcinella” and “The Rite of Spring”, two ballets of Igor Stravinsky (1882 – 1971), prominent composer of the 20th century, who never denied his Ukrainian origin. Stravinsky was born in the family of Fedir Stravinsky, the soloist of the Mariinsky Theater in Saint Petersburg, who descended from the ancient Cossack family of Sulyma and began his career as a singer in Kyiv Opera House. Once the composer noted that the documents of his origin were lost, but memory could not be blotted out. The composer restored his historical surname Stravinsky-Sulyma to his son Sviatoslav, famous European and American pianist. Mother of the composer, Hanna Kholodovska, enjoyed coming to her native mansion in Ustyluh, Volyn region. Her son Igor also visited Ustyluh. He fell in love not only with the nature of Volyn region, but also with his cousin, Kateryna Nosenko, and married her in 1906. It was there he built a house, in which he could listen to the songs of the young people singing on the streets; it was there, he returned to, “to the creative paradise”, during several years before final emigration to Switzerland and then to France. Composing the ballet “The Rite of the Spring” in Ustylug, Igor Stravinsky invited a lirnyk, itinerant Ukrainian musician, to perform folk songs or legends. By the age of 20 Igor Stravinsky did not think about the career of a professional musician or composer, although he had been learning to play the piano from the very childhood. He entered the Faculty of Law of St. Petersburg University and practiced music privately. His first teacher of harmony (apparently not accidentally) was the Ukrainian composer Fedir Yakymenko (brother of prominent Ukrainian composer Yakiv Stepovyi). Stravinsky regarded composer Mykola Rimsky-Korsakov as “the second father,” who was his tutor in 1902-1908. The teacher and his musical language had the greatest influence on the early creativity of a young composer: Stravinsky took his bright exuberance of the orchestra, colours of harmony and melodies, the appeal to fairy-tale and folklore. Such a bright and colorful music is peculiar to three early ballets of I. Stravinsky (“The Firebird”, “Petrushka”, “The Rite of Spring”). And only “The Rite of Spring” contains original musical solutions – in rhythm, orchestration and processing of folk melodies that significantly outrun their time (as if predicting the dynamics of movement and fast pace of the entire 20th century), and glorified Stravinsky in the circle of artists- followers, and then – in broad circles of listeners who did not apprehend this work immediately. The premiere of “The Rite of Spring” was on May 29, 1913 in Théâtre des Champs-Élysées in Paris. Scenery and costumes were created according to the sketches of the famous artist Nicholas Roerich; choreography was staged by prominent dancer and choreographer Vaslav Nijinsky. Despite the all-star cast, the ballet was hissed off, probably because of unusual choreography and music. However, the prominent outstanding entrepreneur Sergei Diaghilev, who commissioned music for ballets of the so-called “Russian seasons in Paris” and who loved innovations and risks, emphasized: “This is a complete victory! Let them hiss and rage! You will see the consequences”. These words turned to be prophetic. In a very short time, ballet of I. Stravinsky became one of the most popular in the world. Stravinsky composed the ballet “Pulcinella” for Sergey Diaghilev who was looking for a fresh plot for his ballet shows in Paris. In Italy he came across a story about Pulcinella, a hero of traditional Italian commedia dell’arte (so-called “comedy of masks”, where each actor performed in a mask and personified a certain type). The plot is based on adventures of Pulcinella who loves Pimpinella, and his friend Florindo who loves beautiful Prudenza and Cloviello who loves Rossetta. Young people quarrel and reconcile, but the story finishes with inevitable happy end. Diaghilev decided to combine the ballet with authentic baroque music. He chose G. Pergolesi, the author of the first comic opera “La serva padrona”, and his contemporaries. To make the music sound more contemporary, he began to think about arrangement, which he proposed to I. Stravinsky in 1919. At first the composer refused, but then he changed his mind and began to work inspirationally. The premiere of ballet was on 15 May 1920 in the Paris Opera under the baton of Ernest Ansermet; costumes and scenery were designed by Pablo Picasso (that was a reason for ballet success); choreography was created by Léonide Massine. Within one performance, “Truth beneath the Mask”, on the stage of Lviv National Opera two radically different ballets of I. Stravinsky will unexpectedly rise up in the integral unity through modern art of the Italian choreographer Marcello Algerie, production by Vasyl Vovkun and under the baton of the famous American conductor of Ukrainian origin, Theodore Kuchar. Протягом 1919 -1920 років знаменитий композитор Ігор Стравінський працював над балетом зі співом «Пульчинелла», який він задумав одну дію. В основу даного твору покладена музика Перголезі, Галло та інших композиторів XVIII століття. Вперше вона прозвучала в травні 1920 року в паризькій Гранд-опера. Оркестром диригував Е. Ансерме. Традиційна італійська комедія дель арте стала для Стравінського натхненням під час створення даного балету, головним героєм якого став Пульчинела. Танцівником Леонідом Мясіним було написано лібрето і придумана хореографія. Легендарний художник Пабло Пікассо працював над створенням декорацій і костюмів для балету. Організатору «Російських сезонів» Сергію Дягілєву вдалося зібрати талановитий колектив. Він задумав постановку, грунтуючись на лібрето XVIII століття. Автентична музика того часу мала стати основою балету. Спочатку Дягілєва зацікавили твори Джованні Перголезі. Деякі історики писали, що музика саме цього композитора звучить в «Пульчинеллі». Насправді для балету використовувалися мелодії і інших композиторів – Карло Ігнаціо Монца, Уніко Віллема ван Вассенара і Доменіко Галло. Частина дослідників стверджує, що в балеті звучить навіть музика Алессандро Паріотті. У 1919 р диригентом Е. Ансерме було написано листа Ігорю Стравінському, якого той просив про аранжування мелодій XVIII століття. Спочатку композитору ця ідея не припала до душі, але після знайомства з матеріалом з лондонських і неаполітанських бібліотек, який йому надав Дягілєв, Стравінський змінив своє рішення і почав працювати над аранжуваннями. У музичній основі і сюжеті «Пульчинелли» багато запозичень, що належать до пізнього бароко. Стравінський же зробив ухил в легку і примхливу музику. Вона більше лягала на комічний сюжет балету. Композитору довелося досконально пересотворити старовинні мелодії. Частину текстур і тим він запозичив, але осучаснив їх. Свою сюїту Стравінський закінчив в 1922 році. Бостонський симфонічний оркестр зіграв її на прем’єрі в грудні того ж року. За диригентським пультом стояв П’єр Монтес. У первинному варіанті були відсутні партії вокалу. Стравінський повертався до роботи над сюїтою в 1949 і 1965 роках. На думку істориків музики, неокласичний період композитора почався саме з цього твору. У фінальному варіанті «Пульчинелли» беруть участь «ріпіено» (у складі трьох контрабасів, трьох віолончелей, чотирьох альтів і восьми скрипок), «концерт» (в складі контрабаса, віолончелі, альта і двох скрипок), тромбон, труба, два роги, два фагота, два гобоя, дві флейти пікколо і три сольних виконавця (бас, тенор і сопрано). Варто зазначити, що цей балет став основою для написання Стравінським деяких інших творів в новій стильовій манері – неокласицизмі. In 2018 the legendary ballet of Igor Stravinsky “The Rite of Spring” celebrates its 105 anniversary. The plot is based on Stravinsky’s dream, in which he saw the ancient rite – a young girl surrounded by the elders is dancing to exhaustion to awake the spring and dies. From the scandal to the masterpiece – such was a predictably thorny path of the ballet of Igor Stravinsky “The Rite of Spring” in the history of world art. “The score written by the composer will be understood only in 1940,” said one of the theater critics after the premiere, which made the highly respected Parisian audience feel a deep cultural shock. These words proved to be prophetic. The fantastic alliance of the talents of three geniuses – Stravinsky, Roerich, and Nezhinsky – produced an absolutely innovative performance that possesses the most inexhaustible energy and such a power to influence the viewer that its secret has not been uncovered to this day. The premiere of “The Rite of Spring” was on May 29, 1913. The work of Igor Stravinsky is considered to be one of the most influential in the history of ballet, however it is most controversial. With its wild energy “The Rite of Spring” literally broke the rules of classical music. The ballet lasts only 33 minutes and is a reconstruction of the pagan ritual in Russia. There is no clear plot; during the celebration a girl is chosen to be sacrificed for spring to come. Both music and dances were revolutionary. Complex rhythmic structures, dissonances and strange sounds were used. Choreography created by legendary Vaclav Nezhinsky challenged the established norms. The movements of the bodies were sharp and fractured, which directly contradicted the elegant forms of traditional ballet. The ballet was presented by Sergey Diaghilev, and the scenery was created by Nicholas Roerich. Several books were written about then music and choreography of “The Rite of Spring” that revolutionized classical music and dance. However, the ballet was hissed off during the premiere because music and dances were too harsh and “wild”, too stunning for the exquisite taste of the musical elite. The world was simply unprepared for the release of such a work. The premiere took place in a theater on the Champs Elysees in Paris and the audience started a riot. Just a few minutes after the beginning of the ballet, some began to boo. And there were those who supported Stravinsky and his work. The two camps almost began to fight in the theater, while the ballet was still on the stage. The police were called, but before the beginning of the second part, they already lost control of the situation. The noise from the audience was so loud that the dancers on the stage were not able to hear music. Nezhinsky sit on the brink of the stage and shouted cues, so that the dancers could hear him. The reaction of the audience was so strong that the composer was forced to flee the theater before the performance finished. Although “The Rite of Spring” is now considered to be a music masterpiece, the work is definitely one of the most controversial in the history of classical music.